Home-Start are moving to new premises! Hello to Stevenson House! Goodbye to the Community Education Office! 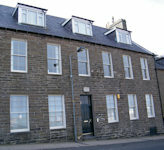 As of Wednesday 2nd May 2012, Home-Start Caithness will be moving to a new home - Office 4, Stevenson House, 10 Harbour Terrace, Wick, KW1 5HB. HomeStart have been at the Community Education Office since Home-Start Caithness was 'born' 13 years ago, so 3rd May will be a mixed day - one of sadness at leaving to Community Education Office, but one of happiness going somewhere fresh and new. HomeStart will be one of the first organisations to move into the new office complex in the recently renovated former Customs and Excise building in Harbour Terrace. 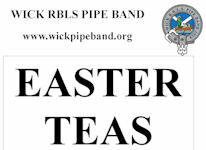 The building has been bought and renovated to a high standard by Dunbeath Estates Ltd.
A group of Caithness youngsters spent the first week of their Easter holiday working on a music project about the Pentland Firth, the world-famous tidal channel between Orkney and Caithness. Over the years, the RNLI has often been called out from Thurso and Wick, as well as Longhope, Kirkwall & Stromness to deal with emergencies caused by the ferocious sea conditions in this part of Scotland. It was to honour this work that Piping Arts Limited and Caithness Horizons invited the Scrabster-based RNLI crew and volunteers to hold a fund-raising event during a concert performed in the Caithness Horizons museum exhibition hall at the end of the week-long project. As research for creating music on the theme of the Pentland Firth, the children considered a wide range of uses of the tidal rip - everything from traditional creel-fishing to the current cold-water surfing scene that is emerging on Caithness waves. As well as meeting crew from the RNLI, they met local surfers, and got an insight into the thrill of standing upright in 'the Barrel' - the inside of a wave as it curls around and above a surfer's head. 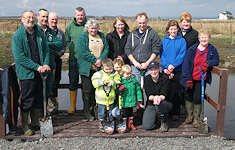 Volunteers completed the final stages of the pond project at the new community woodland at Newtonhill, Wick on Sunday (22 April 2012). The overall project has involved excavating and landscaping an old pond and installing an all abilities pond dipping platform. The volunteers added the finishing touches by planting a range of flowering shrubs and plants around the pond area. These plants will attract wildlife onto the site by creating useful habitat. The volunteers also prepared ground and sowed a range of wild flower seeds. One area is specifically targeting butterflies, bees and birds while the water margins around the pond were sowed with water tolerant plant species. 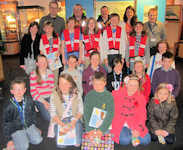 Could you be one of our new volunteers? Please call Naomi or Rachel by Monday 30th April on 01955 606222 to find out more! ACADEMY made heavy weather on their return game with ‘Turra’ but ground out the result, at Harmsworth Park. The visitors were obviously a more experienced side than the Brora outfit the Scorries demolished earlier in the week. With United down to 10 men following a dramatic touchline incident, in the first half, which saw Cammy Bowden stroll for an early shower, Academy should have been set to capitialise on the numerical advantage. It wasn’t until early in the second half, however, before Wick secured their opener, the in-form, Gary Weir nodding in a Macadie cross. The visitors evened things up with a giveaway goal after Grant Steven misjudged a back-pass, allowing Gary Harris to nip in and waltz round Gray for the equaliser. Chances went abegging at both ends and Academy had one or two scares before leaving the field as victors after claiming the decider, courtesy of Richard Macadie. 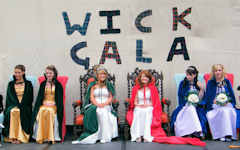 The Wick Gala Committee is currently searching for this year's Gala Queen. They are looking for nominations for girls in 4th, 5th or 6th year. Stall pitches for June's Wick Diamond Jubilee HarbourFest are being snapped up - and the organisers are asking for yet-to-register exhibitors to lodge their applications as soon as they can to ensure their presence at the event. The HarbourFest pitch organiser, Liz Richard-Jones says "We've had a good response so far, including an encouraging number of new exhibitors. 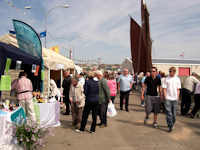 However, many of the 2009 HarbourFest stallholders have told us they wish to exhibit at this year's event but they have not yet registered with us. The closing date for applications is 18th May..............The HarbourFest Committee wish to support community groups, charities and local organisations to take advantage of this popular event. Pitch application forms can be obtained from Liz Richard-Jones (01955 603821 or harbourfest[AT]btopenworld.com) or a copy can be downloaded from the website http://www.wickharbour.co.uk/harbourfest for completion and return to the HarbourFest organisers at the address shown on the forms. Pulteneytown People’s Project will be running new classes week beginning 16th April at the Pulteney Centre in Wick. Due to popular demand Floral Art classes will run on Monday evenings at beginners and intermediate levels. Cost will be £22.50 for a five week course with participants supplying their own flowers. Spanish for beginners will run on Thursday evenings at a cost of £17.50 for a five week course. Internet, email and basic computing courses will cost £12.50 for five weeks with daytime and evening classes available. Afternoon and evening classes are available at Intermediate 1 and Intermediate 2 for the popular PC Passport course which is ILA funded, meaning most learners can claim the cost of this course. Professional Cooking takes place on Monday evenings with a three week course covering starters, main course and desserts. The cost for this course is £20. There are places available on Friday afternoons for Drawing and Painting Studies at a cost of £3.50 a class. A local caithness support group for MS have set up a web site and Facebook page. Take a look if you want help or support or would like to volunteer for the group. Candidates can email items of any length they wish for the election to bill@caithness.org. 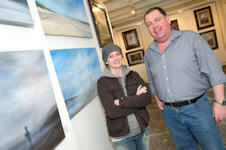 'A moment in time', an exhibition of work by two Latheronwheel artists got off to a flying start at the North Lands Creative Glass gallery at Quatre Bras, Lybster on Friday evening. A collection of paintings by Jane McDonough and photographic prints by Angus Mackay proved a big attraction, with over 100 people attending the preview night. Jane lived and worked as a Graphic Designer and Illustrator in Manchester for over 10 years before moving to Caithness in 2008. She is a self-taught artist and has been drawing and painting for as long as she can remember. "Since moving to Caithness I have been inspired to develop my painting style and what better inspiration than the big dramatic skies and lonely landscapes," said Jane. Planting Day At Newtonhill - Can You Help? Halkirk Family Bowling team Jim and Marie Falconer with their grandsons Kelvin Falconer (Far right) and Kevin Mackay won the Geddes Cup Bowling match in Halkirk. They have played as a team a couple of times before but this is the first time they won together. Now being issued online to save postage and printing costs. The Wick Tri Club 10K will take place on Sunday 8th April at 2pm (registration is 1pm - 1.45pm). The route will be from Staxigoe Hall to Noss Head and return. Entries can be made on entrycentral.com ahead of the event. This is an ideal race for all levels and will give people an opportunity to see how prepared they are for the Mey 10K, which will be 5 weeks later. Also motorists should be aware that runners will be on the road along the route. Dunnet Forestry Trust are holding a FREE log-scribing course in Dunnet Forest under the instruction of Dan Franklin who runs the British Isles School of Log Builders. The course will start on Monday 11 June 2012 and there will be a limited number of places available for students who must own their own chainsaw and hold a certificate of competence for crosscutting and chainsaw maintenance.